– 2 programming key buttons. – 1 LED indicator for engine status. – 1 LED indicator for glow plug pre-heating. – 5 LED indicators for alarm status. – Digital Inputs: 3 negative and 1 positive (start/stop by remote key switch). 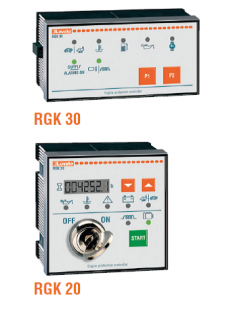 – Digital Outputs: 2 relay (1 programmable). – 1 ON-OFF power supply key selector switch. – 1 semi-automatic engine START button. – 2 programmable key buttons. – 7 digit LCD display (Hours, Hz, VBatt). – Local or remote starting. – Digital Inputs: 3 negative and 1 positive. – Digital Outputs: 3 static (1 programmable). – Inputs, outputs and alarms, all with programmable properties. – Quick set-up port with PC software (TTL/RS232 serial port). 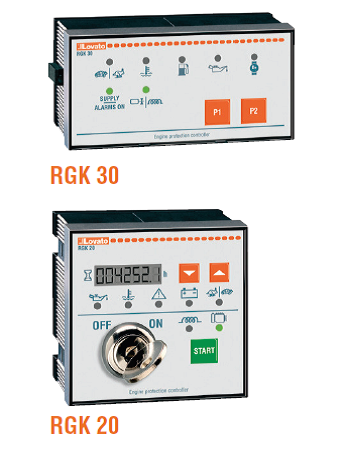 RGK20 12/24VDC, built in power supply key switch, with TTL programming port, 72x72mm, 0.270kg.